Hello, when did Rank Tracker eliminate deep rank checking? There are many valid reasons to check and record on a daily basis checking where a site ranks beyond 100 positions. Analyzing ranking data 101 - 350 has given me valuable data that has absolutely helped me both rank and find out whether certain keywords were worth investing in. Why has that flexibility been eliminated from Rank Tracker? This seems like the kind of functionality that would mean the difference between renewing all three of my suite licenses or not. It can be difficult distinguishing truth from myth in SEO. The problem is that much of the information on the Web is dated (always be sure to check the date of publication when conducting research) or just plain wrong. Opportunity Max has gathered some of the most common rumors currently circling the Web to help clear up confusion caused by conflicting information. Not sure how that applies to anything I said. Let be attempt to be more clear and succinct. I need an explanation from someone that represents Rank Tracker software regarding why Max Number of Results has been limited now to just 100 when I have history and proof from multiple sites that being able to see results from Max Number of Results passed 100 has significantly assisted me in helping to rank and ascertain the competitiveness of keyword phrases. Not being able to see results in the 200 range is hurting my ability to do SEO effectively and I am forced to search by hand. This is making me not want to renew Rank Tracker or the SEO PowerSuite. Now, I hope that has cleared up any confusion. No mods ever frequent their own forum? Ridiculous. Then you can change the maximum number of results up to 300 or more. But the Safe Query mode works only within top 100 results, since in this mode the queries go via our servers, so we have to limit the scan depth to avoid Google blocks for our internal proxies. This apparently then presents a huge problem since deselecting the safe search then ensures completely different IPs/proxies will be used thus skewing historical data. So, this doesn't help me with true analytics. Not exactly what anyone would want, huh? I guess I should say thanks that now I can test to get rankings beyond 100 but I can't actually use that data in any real way, can I?! (I ask, rhetorically). You would think that safe search would see beyond 100 as I have provided you with actual reasons why that data is valuable, but whatever I guess. Which would mean the history I currently have would be invalid because up to that point I had used the built-in proxies. I hope i'm explaining this correctly. Do you understand now? 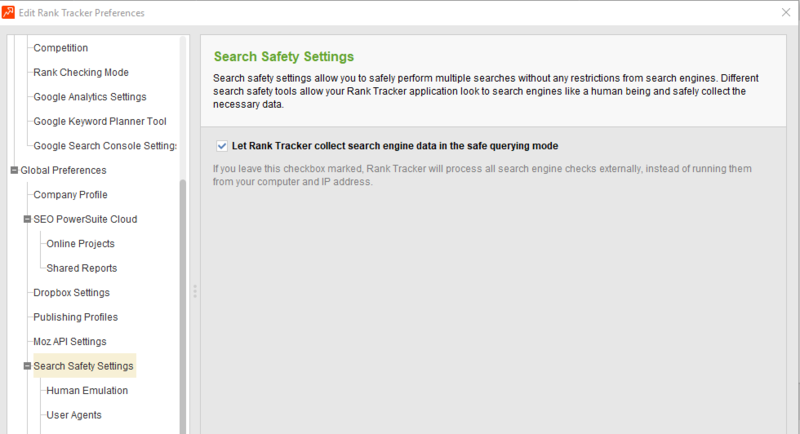 Disabling the safe query mode will not affect your ranking results as much as you think. May be a few keywords will drop/go up for their ranking positions, but the total visibility will hardly change a lot. The main problem would be to solve Google captchas which will start appearing once you disable the safe mode, because all the requests will go via your direct IP then. Thank you for the replies. I've tried to explain why exceeding just 100 results is a necessity for myself and most likely many others, however I emphatically assert that showing results SERPs beyond just the top 100 listings is a necessity for a number of SEOs, myself included. I ask again that we be allowed to change the option so that more than placement for tracked keywords exceed 100 (perhaps 150 or 200 would suffice) and I state again that tracking changes to further optimize for a keyword phrase would be beneficial if we were able to see how changes affect placement beyond just the top 100 results in major search engines. As we have discussed here, deselecting the Safe Search would mean the necessity of using different proxies/IPs and thus would potentially make results untrustworthy. I don't see a valid reason why we are unable to see beyond 100 with Safe Query mode enabled. Thank you again.